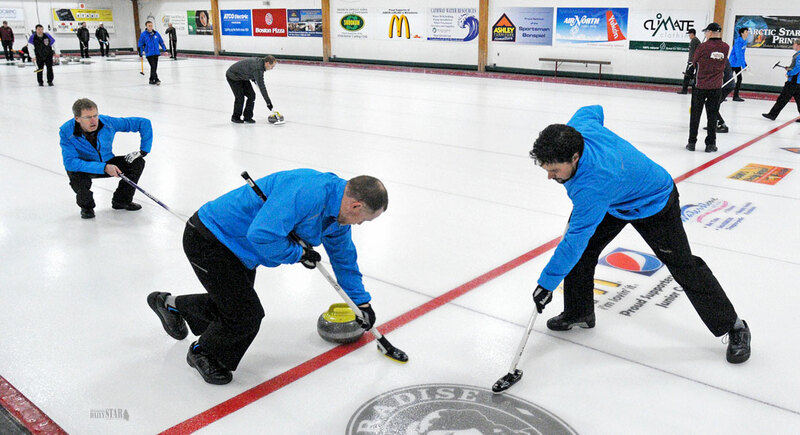 CASHING IN – Wade Scoffin, left, watches as teammates Clint Ireland, centre, and Steve Fecteau, right, sweep his stone towards the house during cash spiel action at the Whitehorse Curling Club Sunday afternoon. It took an extra end to decide the victor at the Whitehorse Curling Club Cash Spiel Sunday afternoon. Wade Scoffin’s rink defeated Pat Paslawski’s foursome 7-6 in an extra end to earn a $1,500 payout – the top prize for the weekend. An early lead by Scoffin was erased when Paslawski scored a deuce in the sixth to tie the game 4-4. Scoffin then scored two in the seventh to go up 6-4, before Paslawski again evened things up in the eighth to force extras. Scoffin’s win came on his hammer shot via a tap-back draw. The winning skip curled in the final alongside lead Clint Ireland, wife Helen Strong and third Steve Fecteau. Scoffin’s usual second, Vern Janz, flew to Ottawa and was unavailable to curl Sunday. Meanwhile, Paslawski’s rink edged Bob Smallwood in the semifinal to earn a date with Team Scoffin. Paslawski and his Cathway Water Resources rink earned $1,000 for finishing second, while Team Smallwood earned $750 after beating Team Baldwin in the third-place game. Seven out of the 10 competing teams finished in the money. The event saw action begin Saturday morning and continue into Sunday afternoon. The cash spiel victory wasn’t the only significant news coming out of the Scoffin camp this weekend. Scoffin – who played third for Bob Smallwood at last season’s Brier – announced he will add free agent skip Matthew Blandford to his roster for the local Brier playdowns. Blandford, 30, currently lives in Cold Lake, Alta., and is a three-time Newfoundland and Labrador junior champion. The skip is battle-hardened after taking part in the very tough Alberta Brier playdowns the past few years. Team Scoffin and Team Baldwin are the only two local teams to take advantage of a new Curling Canada ruling that allows elite teams to include a non-resident on their roster, Yukon Curling Association executive director Laura Eby said today. Free agent signings had to be announced a month prior to the Yukon Brier and Scotties playdown entry deadline of Dec. 22. “I’ve got lots of connections in the curling community and we wanted to take advantage of the change in the rules,” Scoffin said of the decision to add Blandford. Fecteau has previous commitments and will be unable to participate in the 2016 Brier, if his team makes it. Scoffin’s rink is expected to be one among several vying for the Yukon Brier position Jan. 14 to 17, 2016 in Whitehorse. Smallwood and Paslawski have also declared their intentions to the Star, and more teams are expected to join the fray. The 2016 Tim Hortons Brier will take place in Ottawa, March 5 to 13, 2016. Meanwhile, Thomas Scoffin (Wade’s son) also made it to the final of the World Curling Tour’s Dawson Creek Cash Spiel yesterday. His University of Alberta rink lost the final 5-1 to Kurt Balderston’s rink out of Grand Prairie, Alta. Despite the loss, the younger Scoffin earned $1,800 for his efforts.